The first season of the Indian National TSD Rally Championship met with enough success to warrant a second running of the event, something TSD enthusiasts in India were thoroughly happy about. Which is why we headed to Nashik for the first round of the second season of the Indian National TSD Rally Championship that was held on the 28th and 29th of September. 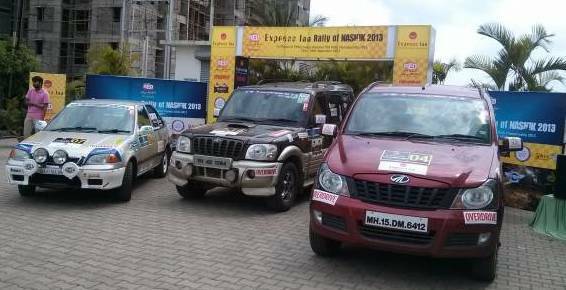 The Express Inn Rally of Nashik was a well attended event and saw participation from TSD aficionados across the country. Yes, the same lot who can be seen poring over tulip notes and doing complicated mental mathematics at nearly every single TSD rally held through the year. After all, this wasn't just a single event they'd compete in. In the larger scheme of things, this was a chance to get a head start in the championship and fight it out the title crown. So, the Express Inn Rally of Nashik kicked off from Shubham Water World early on Saturday morning. And it really did appear that the rally was well-attended - 15 cars set out in the National Category, while there were 8 two-wheelers and 21 four-wheelers entered in the local category. The names featured in the National Category were quite prominent - Satish Gopalakrishnan and Savera D'Souza (reigning Indian National TSD Rally Champions), Karthick Maruthi and Shankar Anand, Girijashankar Joshy and Shrikanth Gowda amongst others. So the competition was all set to be terribly stiff. All the better, if you ask us! When the rally kicked off though, the participants made their way from one Time Control to the next. Then, confusion reigned supreme. From where we were standing we could see participants going around in circles a little bit, before nearly every car in the national category found itself parked by the side of the road. The contestants appeared to believe that there was something wrong with the Tulip Notes, declaring that a T-junction hadn't been marked. However, with the road book only marking directional changes, and with a right turn not possible at that particular junction, the organisers were confident that there wasn't anything wrong with the road book or tulip notes. One way or another, some participants made their way through, finding Time Controls along the way. Others took a few wrong turns here and there, missed out on Time Controls and were thus disqualified from the rally. Things got a little sticky when some participants, who had exceeded their Maximum Penalty Limit, were then disqualified from the rally. However, at the end of the event, it was Karthick Maruthi and Shankar Anand who won the first round of the event, making an early assault on the championship. Finishing second were C Machaiah Babno and G Natarajan Rajanna, while Girijashankar Joshy and Shrikanth Gowda finished third. The next round of the TSD Rally Championship will now be held between the 18th and 19th of October, 2013 at Chikmagalur.